Founder of the dental clinic BDD in Milan and of the medical IT company M.M.SOLUTION (ATLAMED). Degree in Medicine and Surgery, specialization in Dentistry and Dental Prosthesis at the University of Milan. Collaboration in clinical dentistry at the Milan Policlinic Hospital, Faculty of Periodontology and Prosthodontics of Italian institute of Stomatology. Taught Higher Education courses at St. Clare Clinic (MI), Master classes, Prosthodontics, Periodontology and advanced courses on Guided Tissue & Bone Regeneration Technique (GTR/GBR) and Implantology. Collaboration with Dr. Kirsche, a world-renowned pioneer in the field of Perio-Implant-Prosthetics and creator of the IMZ implant technique. 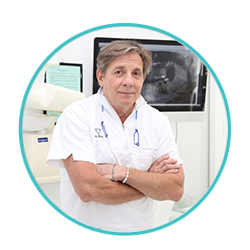 Over the years, within BDD, has trained many young doctors, using his own clinical protocols developed in more than 15 years of experience. Fellowship: Lund University (Sweden), Leuven University (Belgium) and Eastman Clinique University (London).